I-74 in both directions: Alternating lane closures. Between I-80 (Davenport) and the Mississippi River bridge (near Moline). There are alternating lane closures because of night time construction work. From 9:00PM CDT to 6:00AM CDT on Sunday and from 7:00PM CDT to 6:00AM CDT on Monday, Tuesday, Wednesday and Thursday. Until June 26, 2019 at about 6:00AM CDT. I-74 eastbound: Ramp restrictions in force. At Exit 1: 53rd Street (Davenport). Ramp restrictions are in force. Right entrance ramp. Night time construction work is in progress. There is a width limit in effect. Width limit 10'0". From 9:00PM CDT to 6:00AM CDT on Sunday and from 7:00PM CDT to 6:00AM CDT on Monday, Tuesday, Wednesday and Thursday. Until June 26, 2019 at about 6:00AM CDT. At Exit 2: US 6; Spruce Hills Drive; Kimberly Road (Bettendorf). Ramp restrictions are in force. Right exit ramp. Night time construction work is in progress. There is a width limit in effect. Width limit 10'0". From 9:00PM CDT to 6:00AM CDT on Sunday and from 7:00PM CDT to 6:00AM CDT on Monday, Tuesday, Wednesday and Thursday. Until June 26, 2019 at about 6:00AM CDT. I-74 eastbound: Left shoulder closed. At Exit 3: Middle Road and Locust Street (Bettendorf). The left shoulder is closed due to road construction work. Until May 24, 2019 at about 6:00AM CDT. I-74 eastbound: Intermittent lane closure. At Exit 3: Middle Road and Locust Street (Bettendorf). A lane is closed intermittently because of night time construction work. From 7:00PM CDT to 6:00AM CDT daily. Until May 3, 2019 at about 6:00AM CDT. I-74 eastbound: Right shoulder closed. Between Exit 3: Middle Road and Locust Street and Exit 4: US 67; Grant Street and State Street (Bettendorf). The right shoulder is closed due to road construction work. Until May 24, 2019 at about 6:00AM CDT. Between Exit 3: Middle Road and Locust Street and Exit 4: US 67; Grant Street and State Street (Bettendorf). A lane is closed intermittently because of night time construction work. From 7:00PM CDT to 6:00AM CDT on Sunday, Monday, Tuesday, Wednesday and Thursday. Until May 3, 2019 at about 6:00AM CDT. I-74 westbound: Expect changing traffic patterns. At Exit 4: US 67; Grant Street and State Street (Bettendorf). Expect changing traffic patterns due to road construction work. Until December 3, 2019 at about 8:00AM CDT. I-74 westbound: Right lane of exit ramp closed. At Exit 4: US 67; Grant Street and State Street (Bettendorf). The right lane of the exit ramp is closed due to road construction work. There is a height limit in effect. Height limit 15'8". Until January 1, 2020 at about 11:59PM CDT. I-74 westbound: Roadway reduced to one lane. 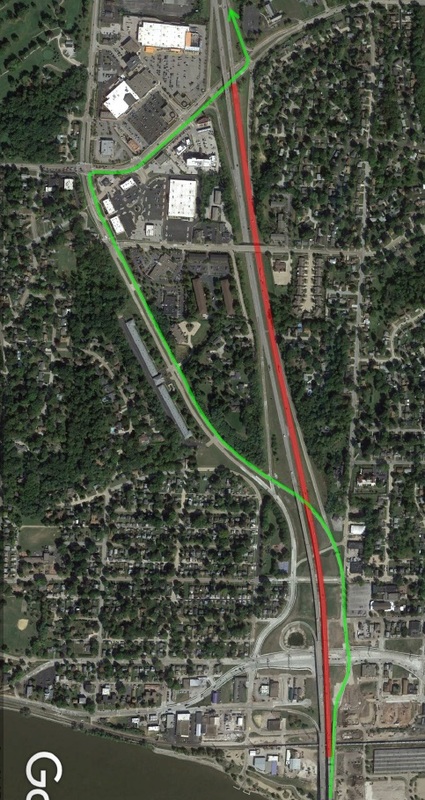 Between Exit 1 - River Drive (Moline) and Exit 4: US 67; Grant Street and State Street (Bettendorf). The roadway is reduced to one lane due to road construction work. There is a height limit in effect. Height limit 15'8". Until December 3, 2019 at about 8:00AM CDT. Between Exit 3 - Avenue of the Cities and Exit 1 - River Drive (Moline). The road is closed due to bridge construction work. A detour is in operation. Until November 26, 2019 at about 8:00AM CDT.